This review first appeared in the April 2012 issue of hi-end hifi magazine fairaudio.de of Germany. You can also read this review of the Elac FS 249BE in its original German version. We publish its English translation in a mutual syndication arrangement with the publishers. As is customary for our own reviews, the writer's signature at review's end shows an e-mail address should you have questions or wish to send feedback. All images contained in this review are the property of fairaudio or Elac - Ed. How about spending your evenings with a lithe one of medium height dressed in tight-fitting black? Might she not have a few virtues and abilities you’ve been missing with your current flame? Let me share a few experiences then. But stop now if you feel in the wrong movie or magazine. I’m talking of Elac’s FS 249 Black Edition. That’s a floorstanding loudspeaker of 105cm height and about 29kg weight. Even objectively viewed it amounts to attractive proportions. Needless to say my wife remained informed about everything. Which prompts the question. Can speakers be feminine? Isn’t proppa gramma der speaker? How about die Elac then? Whatever. After extricating Elac’s FS 249 BE from its shipping carton and removing the protective wrap, the emerging elegance of piano-gloss columns made the female connection relevant. And this lady turned out to be quite accessorized too. The carton contained white cotton gloves, spikes including a soft-nosed variant, rubber plugs for the rear-firing ports (Bass Control) and felt-type foam rings (Jet Dispersion Control) to alter the dispersion pattern of the tweeters for critical rooms. Then there was a lengthy owner’s manual and multi-lingual flyer with well-meaning albeit also naïve advice which must be necessary. Apparently. How about that warning not to connect this passive speaker to your home's electricity directly? I promised solemnly that I wouldn’t do such a dastardly thing. Phew. My up to now sketchy familiarity with the Elac company was duly updated by surfing across their recently relaunched website. Here the Electroacustic GmbH has actually penned a short chapter on German industrial history. To extrapolate, the Kiel-based firm founded in 1926 began developing echo test gear and acoustic transmissions in both water and air. A contract with Siemens to build a radio then opened the doors to consumer electronics. 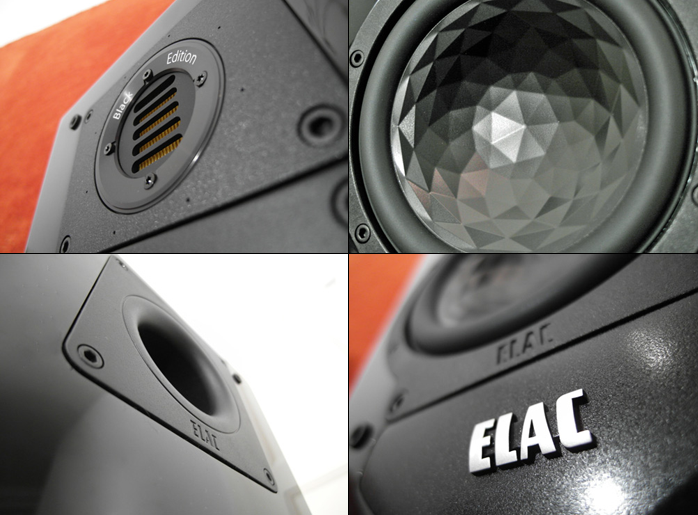 During the decades after the war Elac grew into an important member of the domestic entertainment electronics sector. By 1978 bankruptcy proceedings and a concomitant fire sale inserted a few stressful years. This stabilized by 1984 and focused the firm squarely on loudspeakers. Today Elac takes pride in its deep vertical integration. All drivers are of their own design and predominantly manufactured on site. Given current globalization trends that’s certainly neither the simplest nor cheapest way of doing things. With the 249 BE the €4.999 sticker buys you a pair of midsize 3-way towers with ported alignments and proprietary drivers. 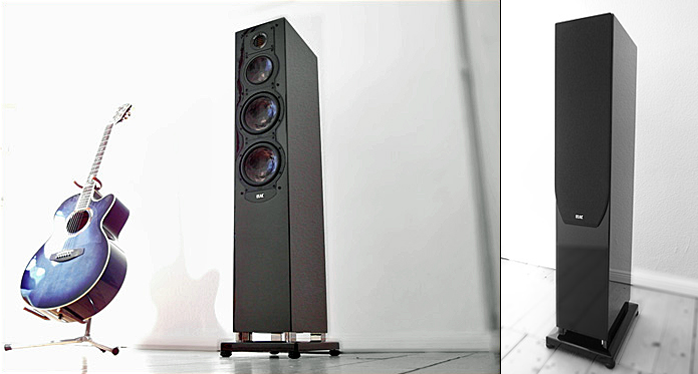 Two 18cm aluminium sandwich woofer cones from their Crystal series handle the bass. These faceted diaphragms suggest crystalline formations and are claimed to improve self damping and large-signal handling from increased pistonic precision. The midrange driver above these woofers adopts the same geometry. Whilst my personal proclivities had some troubles with the crystal cosmetics, the cone surfaces weren’t shiny silver like on the 240 model without BE suffix but blacked out and thus markedly more demure. The high frequencies are covered by the firm’s well-regarded Jet tweeter, a multi-pleated aluminium-traced kapton foil affair based on Oskar Heil’s air-motion transformer which squeezes air through its ca. 0.84mm wide lamellas. This type of driver achieves high propagation velocities and is considered very dynamic. 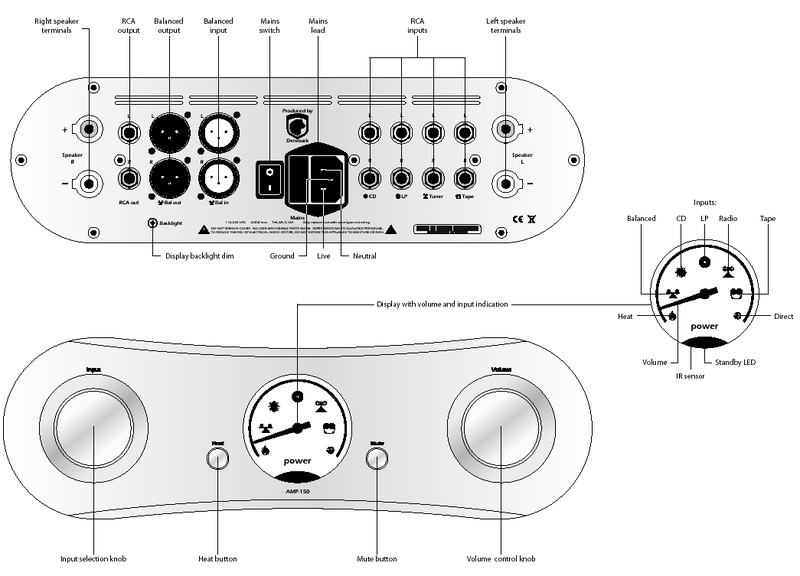 Firms like Burmester and Adam too rely on it for their tweeters, the latter firm even for dedicated midrange units. I noted tight tolerance fits between drivers and cabinet even though the baskets of the cones were composite rather than cast metal. That’s acceptable though since it was done for sonic reasons - especially improved resonance behavior says Elac who use the same Polyamid recipe with high glass-fiber content for their costlier 600 Series. I was disappointed then to spot ordinary wood screws to fasten such upscale drivers. Could Elac’s bean counters not at least grant us drive-in nuts if the budget forbade properly threaded inserts? Via short chromed cylinders the speakers park atop their own plinths to fix the precise distance which loads the downfiring ports. Said plinths couple to the floor via the enclosed spikes. Around back at roughly tweeter height sits a second port which can be run open or sealed with the above-mentioned rubber plug. That adapts the 249 BE’s bass performance to various room conditions. In my 24m² space the freestanding placement sounded livelier and more assured with the ports open.